Lawn dethatching is recommended when thatch accumulates to 1/2" or more. Excess thatch prevents water and nutrients from reaching the soil and may contribute to turf disease. Free swinging flail blades mounted to a 20" adjustable depth reel comb out excess thatch, removes moss and breaks up aeration plugs. Treat moss/ weeds 1-3 weeks prior to using Thatcher. Use an aerator first to relieve soil compaction and improve root depth. 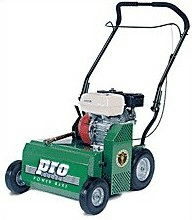 Follow with Power Rake/ deThatcher to break up plugs and comb out thatch/moss/weeds. Rake up loose material and top dress aeration holes with sand, planting mix or steer mulch to further reduce compaction and increase drainage. Be sure to apply lawn seed @ 5 lbs per 1000 sq.ft. to avoid bare/thin spots. Seed can also be applied with a slice seeder or Mataway overseeder for best germination on bare spots or to rejuvenate old worn looking lawns. Wt. 160 lbs Width 26.5" Length 45.5"
* Please call us for any questions on our thatcher billy goat flail blade rentals in Portland OR, Gresham OR, Milwaukee OR, and surrounding metro area.